The committee meets a few times during the year to discuss issues regarding the club. If you are interested in becoming a committee member, please contact us using the details provided below and on the contact us page of this site. Hi, my name is Marie and I share my life with my teenage son Lachlan, and my Great Dane Isaac. I've been involved in the Great Dane community for a few years now, and on the committee for two. I enjoy being able to help where I can. I've had big dogs my whole adult life but I've wanted a Great Dane from the first moment I laid eyes on one, some 35 odd years ago. I thought they were the most magnificent looking dog I'd ever seen and I just had to have one. I finally realised that dream 5 years ago, and I had no idea of the journey ahead. I've learnt so much about this breed since joining GDLAWA and I'm pretty sure my life wouldn't be the same without one. 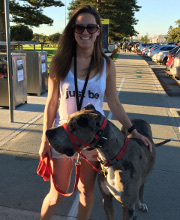 The opportunity to socialise, learn new things and be part of the Great Dane community has been the best thing that has happened to me since getting Isaac. I really look forward to the monthly walks where I can chat with people and meet their gorgeous Danes - and other furry family members too. Lisa as our hardworking rescue coordinator is making sure all Danes that are rehomed via GDLAWA are matched to their best possible home. I've been a member with the GDLAWA since the early days and in more recent years been in the role of Rescue Coordinator. 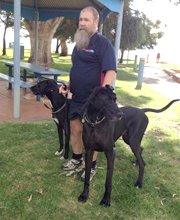 We accept surrenders, find fosters but also works with other rescue agencies or private individuals where possible to rehome Danes throughout WA. Penny is my Great Dane who joined me as a mature rescue girl aged 5 at the time in 2016. I've been lucky enough to have shared the lives of now 3 Great Danes, each individual and unique but equally as special. 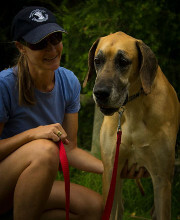 Stubby is a Rescue Team members which means he assists Lisa with enquiries, visits Danes in rescue and visits families interested in rehoming a Dane from the GDLAWA. He is also the monthly Walk Coordinator which means he is scouting for locations to determine the next walk for our enjoyment, and writes the Walk emails which the secretary forwards to the members. Terry (Stubby) Devine has had an assortment of dogs for over thirty years, all of which have been rescues or re-homes including a couple of strays that wandered in and never left. Stubby has always had a Love for Great Danes but unable to put one in his life due mainly to work commitments in the Drilling Industry and the later years, an aging old Staffy cross called Sally. When Sally died in 2010 of age and cancer she was twelve and a half and left a huge hole in the family, to fill that hole, the whole family went to look at a re-home Dane named Ruby who was being separated from a Male Dane named Axle who was also being re-homed, she had lived with him from ten weeks to eighteen months old, who were both in very poor condition. You guessed it, they both went home with Stubby and his family in 2011 and are thriving to the present day. Axle and Ruby Have made such an impact on Stubby he has said "There will always be Danes and only Danes in this home from now on." Sarah is a Rescue Team member working with Lisa. I joined the GDLAWA when I first moved to Perth from Victoria in 2016. Since joining the club with my reactive 2 year old Great Dane Douglas, the club has proved invaluable in transforming both myself and Douglas into much more acceptable members of the dog community! So much so that I joined the committee in 2017 to help with rescue and rehoming. Douglas also plays a big part in the process as my (not so) secret weapon in recruiting new members. Trish is our Support Group Coordinator, which means she finds buddies for new members or guests on their first walk, and is there to offer assistance for anyone needing help or controlled socialisation with their Danes. 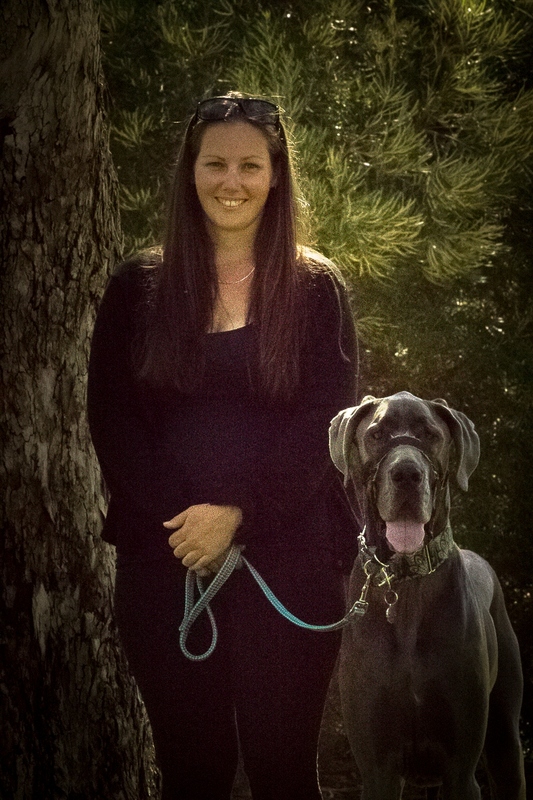 She joined the GDLAWA in early 2005 and has served in many different roles including fostering over 100 Great Danes. Her current dog, Luni Tunes, came to her as a foster and quickly became a foster-fail. She also has the world's largest supply of matching collars and leads. A fact that causes much teasing, especially when a foster or visitor is seen in a non-matching outfit! Having had dogs all her life, and Danes since 1990, along with her intense involvement with the GDLAWA for over a decade, Trish has become somewhat of a club historian. She is the club's resident â€˜nerd' and writes most of the newsletter feature articles and is the creator, data analyst and author of the â€˜2015 Australian Great Dane Health & Lifestyle Survey'. She's a riot at parties if anyone wants to know what percentage of Danes had which illness! Fleur creates our fabulous newsletters for the members to enjoy, and will post relevant articles in the GDLAWA group. Patty is our Merchandise Coordinator and she is responsible for all the Merchandise that GDLAWA sells and also our Hire Equipment. 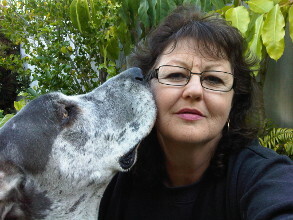 Hi, my name is Patty and I have wanted a Great Dane ever since I saw my first one in Fremantle when a was a young girl. I welcomed my first Great Dane, Trevor, into my life three years ago which I share with my husband, and two feathered friends. Trevor has many quirks, and is full of life. He suffers with IBS and it's been a long, educational journey but we've turned the corner and have a good grasp on what he can and can't eat for the time being. The Club has provided great support in this journey. I enjoy the Club, the monthly walks and all the antics that come with the annual Fun Day, along with the social aspect of it and lots of doggy cuddles as well.